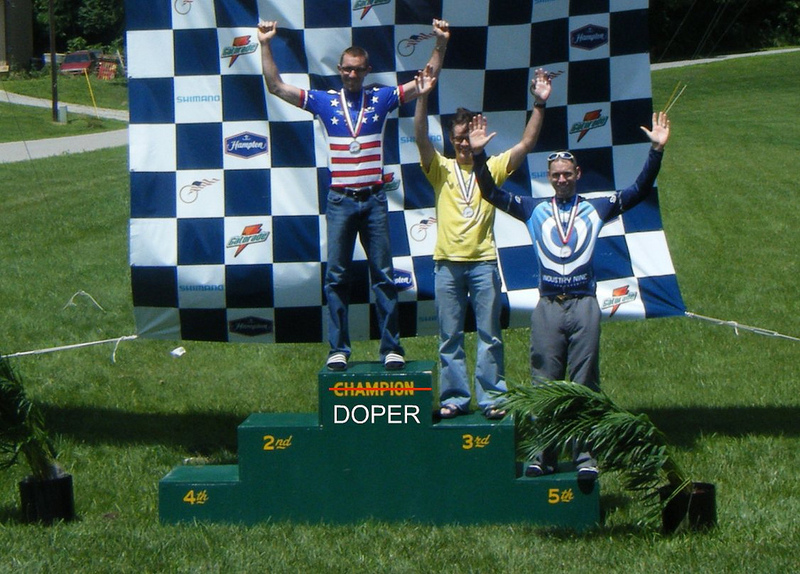 I learned this weekend that the guy who won the 30-34 division of the 2008 Masters national time trial championship has admitted to taking performance-enhancing substances. I placed third that year, so his forfeiture means that I’ll now be awarded the silver medal. I have mixed feelings about this. I was thrilled with my original result because I knew I had done my absolute best. I couldn’t have gone a second faster. Of course, I was happy to have placed so well, and I’m happy to learn that I’ve gained a place. On the other hand, it saddens me to do it in such a fashion. 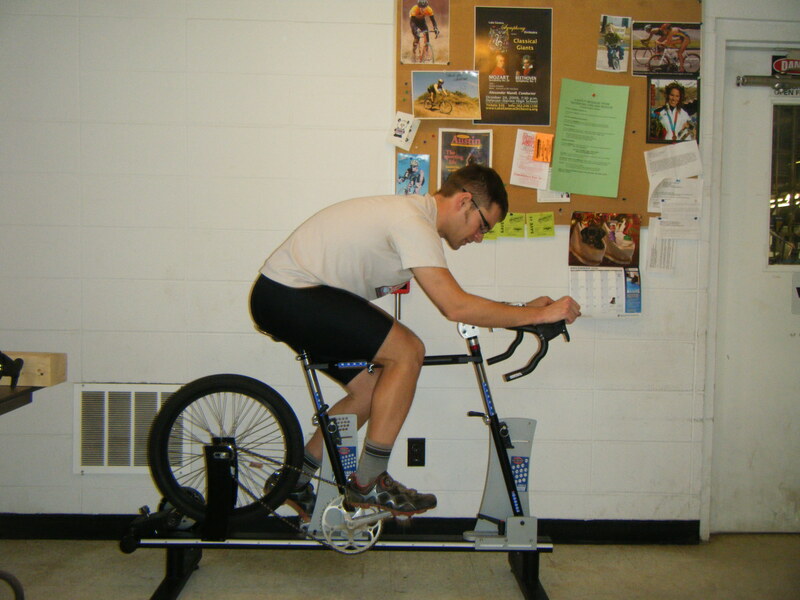 What motivates a 30-year-old cyclist to dope? It’s not like we’re going to get picked up by a pro team and sent off to the Tour de France. And a couple hundred bucks in prize money surely doesn’t offset the cost of the drugs these guys are taking. So what does that leave? Can there really be any satisfaction in beating people when you know you’ve done it not through ability, training, and determination but through drugs? For contrast, here’s how Eric Liddell, the Olympic gold medalist and the subject of the movie “Chariots of Fire” described his motivation: “I believe God made me for a purpose, but he also made me fast. And when I run I feel His pleasure.” That’s how I feel about cycling. God made me reasonably fast, and I feel pure joy when I’m riding as hard as I can, whether it’s in competition or on a solo ride. I bought a set of four in 2000, the year my cycling team was founded. There were four of us, so I kept one and gave the other three to my teammates. They were the “official” team mugs for drinking out of while watching the live (text) coverage of the spring classics on Cyclingnews. In the ten years since I bought those mugs, Carl has passed on, Scott has moved to North Carolina, and Mark and I have become dads, so we don’t ride together as often as we used to. This mug reminds me of how much I still love those guys. 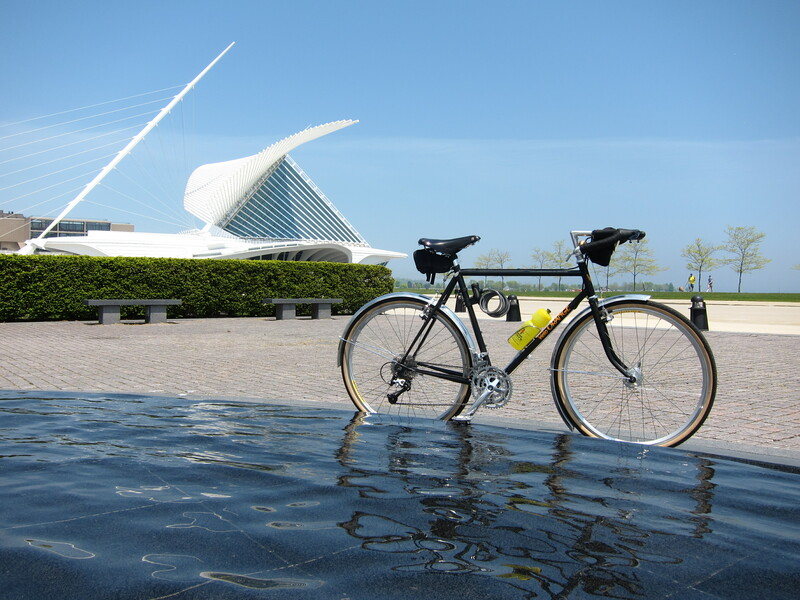 This past weekend, I installed a set of polished aluminum fenders on the Polyvalent and took it for a leisurely cruise down to the Milwaukee Art Museum. Update: more photos of the Polyvalent’s evolution here. 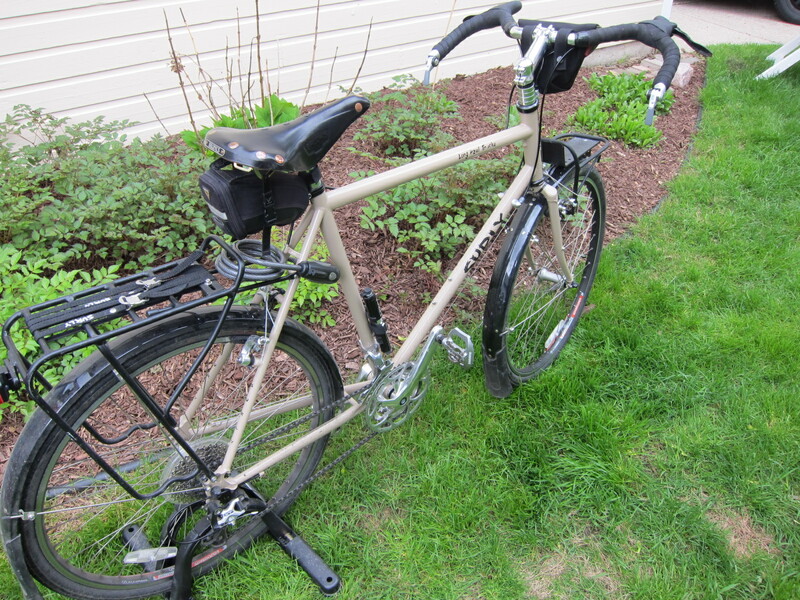 I’ve been commuting on a Surly Long Haul Trucker for about a year. It’s a well-built, well-designed touring bike, but since I don’t do much (any) touring, it’s not ideal for my 5-mile commute. 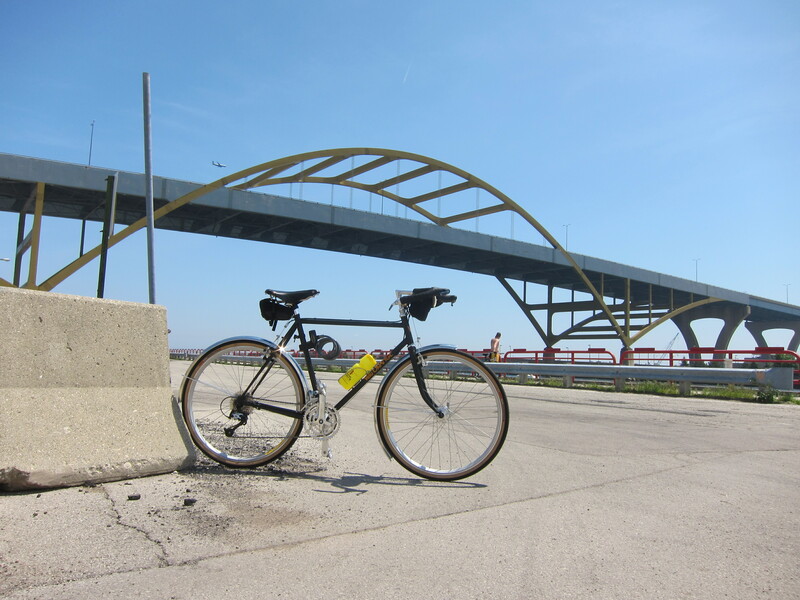 The oversized steel tubes and undersized, 26″ wheels make for a somewhat harsh ride over the rough Milwaukee streets. Before the LHT, I commuted on a Surly Cross Check cyclocross bike. 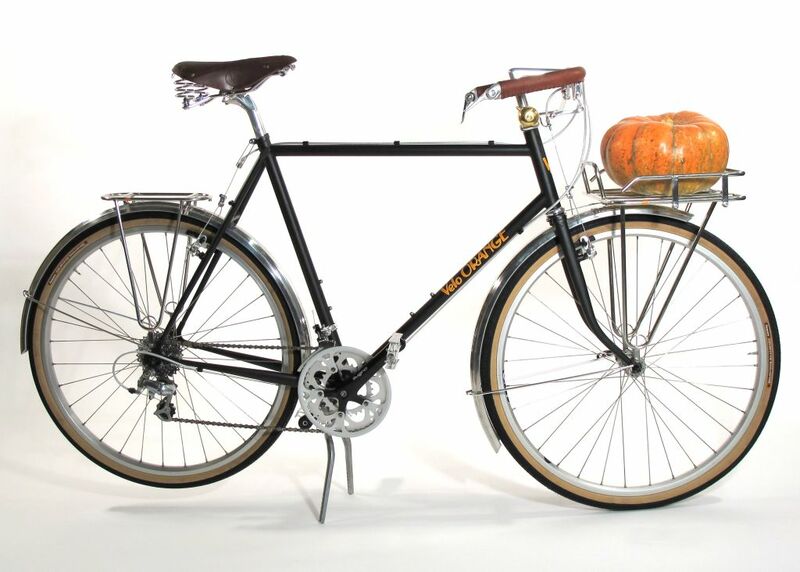 Compared to the LHT, the Cross Check was smoother and livelier, but not as stable with a rack and panniers. Plus, it had long horizontal dropouts, which made it difficult to remove the rear wheel with fenders installed. 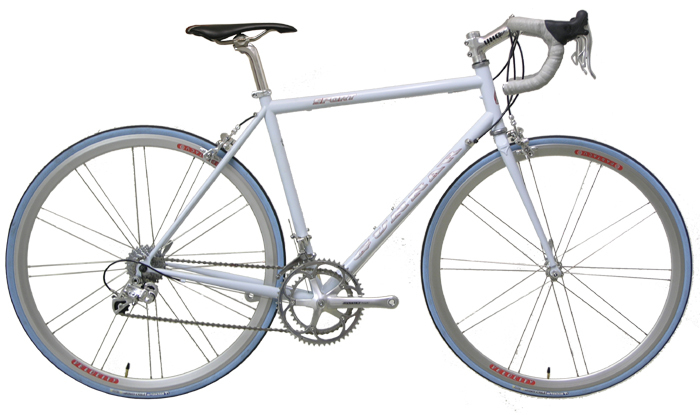 Tomorrow, my new commuter bike will arrive – a Velo Orange Polyvalent. The Polyvalent is a traditional city bike (a porteur, si vous plait). It has 650B wheels, skinnier frame tubing, and geometry that’s optimized for carrying its load up front. I’ll assemble it with parts from the LHT, plus some new stuff. The part I’m most excited about is a dynamo front hub, which will power a headlight that never needs recharging. I’m writing this from a birthing room at West Allis Memorial Hospital, where Kelley and I have been since 4:30 yesterday, when it was confirmed that her water had broken. It’s now 7AM. Kelley has been on a low dose of pitosin since midnight, and she can feel the contractions beginning. She’ll get a full dose soon, which should really get things moving. The timing has caught us a little off-guard. 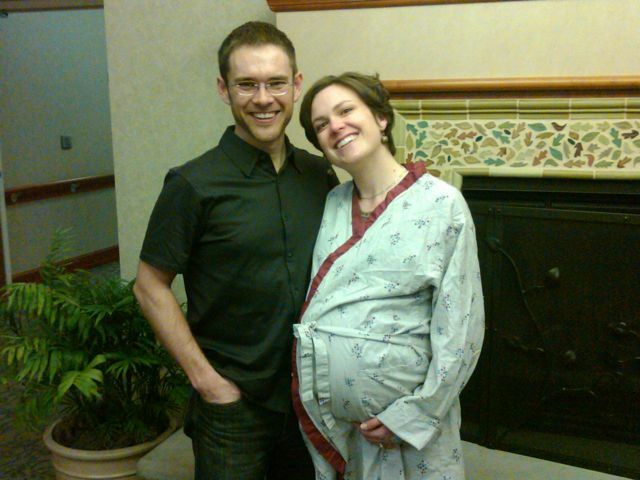 Caleb isn’t due until May 8, but as of today, he’s considered full-term. My mom suspects that he didn’t want to share his birth month with all the other May birthdays in our family. Kelley is glad his head will be smaller today than it will be three weeks from now. I’m hopeful that this is an early indication of German punctuality. Fortunately, we’re pretty well prepared (thanks to a lot of help from her parents). Just two days ago Kelley packed her bag, and I installed the car seat. The nursery is all set up, and we’ve received so much baby clothing that Caleb may never wear the same outfit twice. It’s time for me to eat some breakfast and get cleaned up. God willing, I’ll be holding my son later this afternoon. Every winter, when I ride less and eat (and drink) more, I put on a few extra pounds. My ideal racing weight is about 150, and this year I got up to 167. The culprits – Christmas cookies, beer, and potato chips – not to mention the fact that I’m turning 35 in a couple weeks. My goal is to get to 150lbs by the time Caleb is born, which should be around May 8. This means losing 1.14 pounds per week. To do that, I have to have a daily caloric deficit of about 664 calories. I expect to achieve some of that by forgoing my nightly beer(s) and the rest by cutting out sweets and starchy food. I’m also cutting back on coffee (it makes me hungry) and drinking more water. In addition to reducing my caloric intake, I’m also ramping up my caloric expenditure by hitting the trainer in the morning before work, and often again in the evening. Hopefully this will soon give way to consistent outdoor riding in the near future. It would be great if I could just eat and drink all I want, then burn it off with heaps of saddle time, but I’m afraid that may not be an option until I’m retired and my kids are out of college. This is the deepest I’ve gone into an off-season without a specific set of competitive goals for the coming year. But of course, this is not going to be a typical cycling season. I’m gonna become a dad sometime around May 8, so I don’t have any illusions of reaching new heights of fitness. Instead, this year is going to be about riding when time permits and enjoying every mile, regardless of speed or wattage. 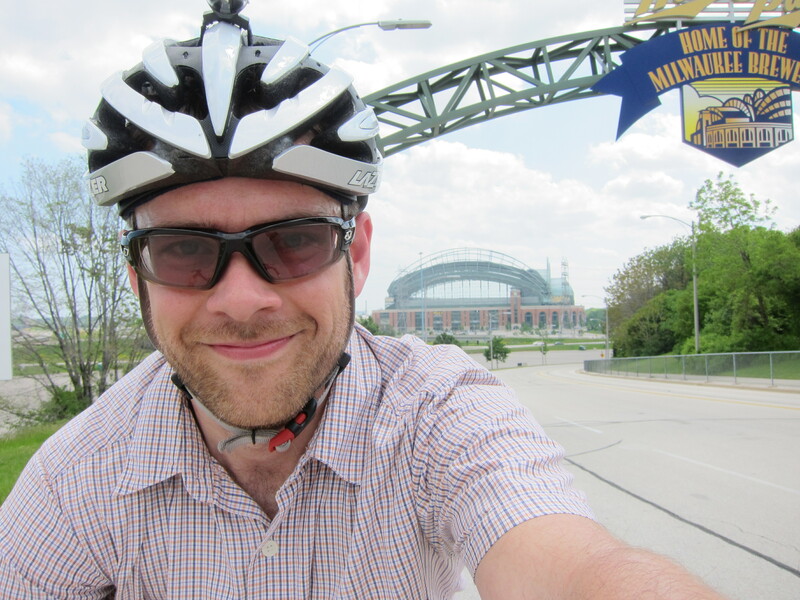 I’m sure I’ll do some races – the Tour of America’s Dairyland in particular – but most of my riding will take place without a number pinned to my jersey. The two things I’m most interested in are non-traditional races like Barry Roubaix and long-distance events like the Dairyland Dare. If there’s a chance, I’d also like to try an S24O ride. Beyond that, I’m looking forward to some early Saturday morning centuries and maybe a WEMS race or two. Once the daylight lasts a bit longer, I’ll start riding to work. 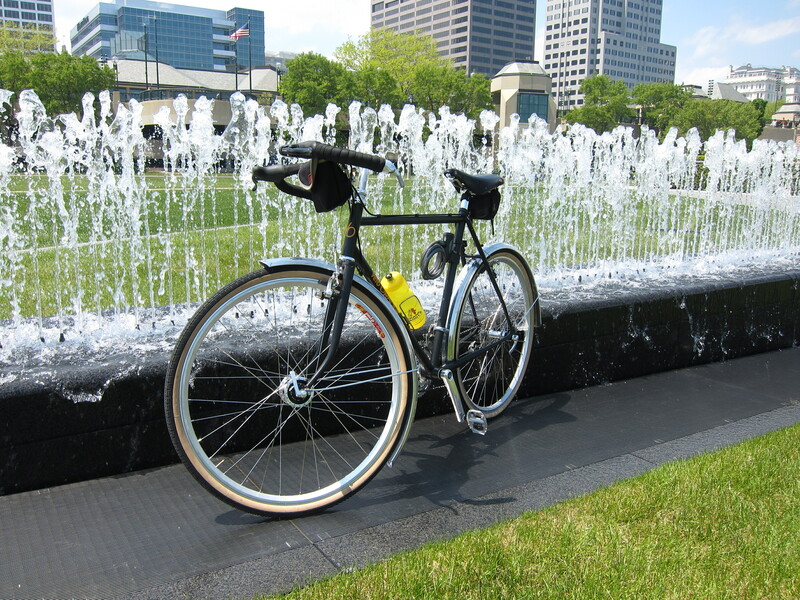 Now that I’m working downtown, my round trip is just 12 miles, which is good, because there aren’t shower facilities at my office. Well, that’s about it. I’m as excited as ever for spring, just for a much different reason than in past years. I owe a lot of people an answer to that question. 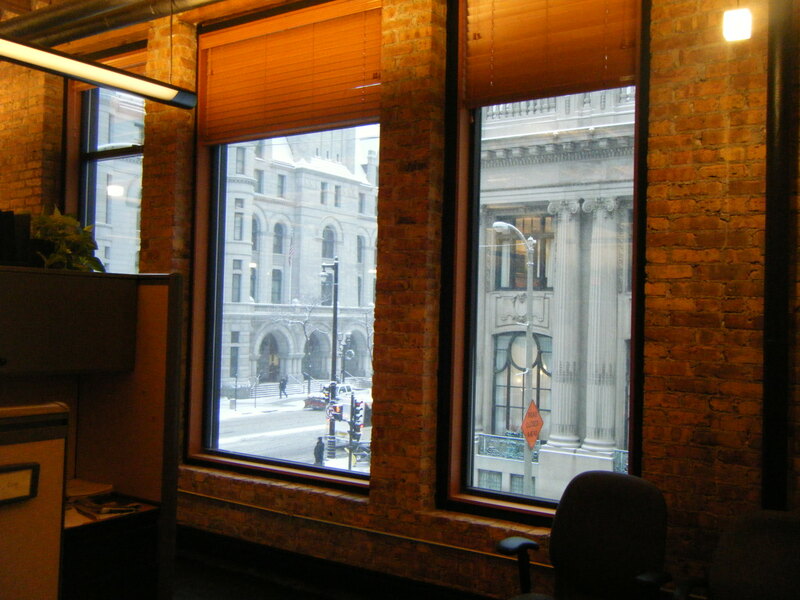 Monday was my first day as an Account Supervisor at Nelson Schmidt, a full-service marketing & advertising agency in downtown Milwaukee. It’s been a busy and fast-paced week, and overall, it’s been very good. Highlights have included friendly coworkers, interesting clients, delicious lunches, a short commute, and a hip workplace. The biggest challenge has been learning the day-to-day procedural stuff. This whole experience, from losing my job at Hayes, through a 10-week period of unemployment, and into this new phase of my career – has been a real blessing. I guess I shouldn’t be surprised, though. It began almost immediately after I prayed that God would strengthen my faith, even if that meant going through a trial. Thanks to everyone who supported me, wrote LinkedIn recommendations for me, and most of all – prayed for me. I really do have some wonderful friends and colleagues. To our relief, it turned out to be Kelley’s Dad calling, not Death. Phew. Yesterday, I drove down to Waterford to get fitted for a custom Gunnar Sport. I’m helping them out with some copy writing, social media, and website design, and in return, they’re building me a bike. Not a bad deal, I’d say. I would have been content with a stock geometry bike, but Richard and Johanna talked me into a custom build. The fitting process took about two hours. I brought my Salsa La Cruz, which is the bike the Gunnar will replace. Johanna began by taking some measurements from the Salsa. Then she measured my inseam, my femurs, my torso, and my arms. She entered this data into a computer, which returned a set of recommended frame dimensions. From there, we went to the Fitmaster, which is a bike-shaped tool that can be adjusted to simulate a wide range of tube lengths and angles. Johanna set it up with my recommended frame geometry, and I rode a bit to see how it felt. The most notable difference was the seat angle. 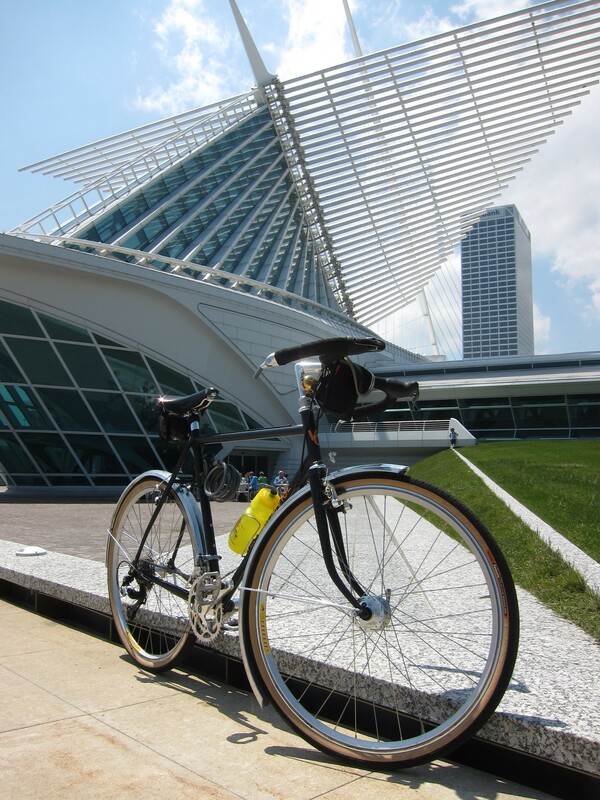 Most bikes (including all of mine) have seat angles of between 72 and 74 degrees. Because of my long torso and short femurs, a 75 degree seat angle was recommended. This put me in a more forward position, which opened up my hip angle and allowed me to stretch out more comfortably. Most of my time on the Fitmaster was spent tweaking the handlebar position. The Fitmaster had an ergo-bend Profile bar, which has a shallower drop and a more acute bend compared to the Ritchey bar I intend to use on the Gunnar. Ultimately, we focused on the position of the brake hoods instead of the drops, which made for a more meaningful comparison. That may not mean much to anyone who hasn’t spent the last few weeks obsessing over frame geometries (the way I have). In a nutshell, this bike will enable me to get in a more powerful and aerodynamic position, with none of the compromises I’ve had to make on my stock-geometry bikes. Additionally, the long front-center dimension will ensure that even with my big feet, I’ll be able to run wide tires and fenders without any toe-overlap. The Sport itself is a cool bike. It’s got a low bottom bracket, which makes it super-stable, but not at all suited to pedaling through corners. It’s also got clearance for tires as wide as 35mm. It’ll be my first choice for training rides, centuries, and any sort of long-distance ride that may involve brief unpaved excursions. I’m going to build it up with SRAM Rival and a Brooks Swift saddle. Oh, and I’m having braze-ons installed on the fork to allow me to mount a Mark’s Rack from Rivendell, in case I ever make good on my intentions to get into randonneuring. After we completed the fitting process, Johanna gave me a tour of the Waterford facility. Click here to view my photo gallery.